The three research themes of the MPRTN program represent mainstream areas of research in medical physics. Training of a new generation of innovators in medical physics requires exposure of trainees to a multidisciplinary environment fostering new developments in radiation physics (Theme 1), imaging & image processing (Theme 2) and radiation response and bio-modeling (Theme 3). Fig. 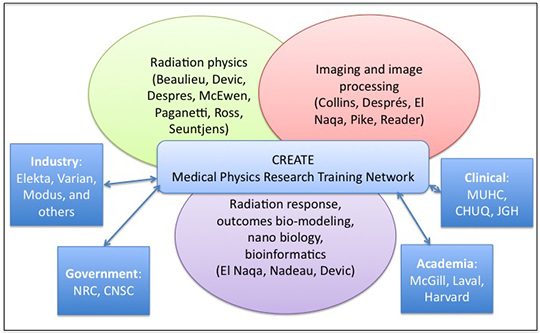 The three themes of the Medical Physics Research Network. Linkages with stakeholders from academia, industry, government and health sector are shown. The trainee will typically perform theme cross cutting research as a result of collaboration or of sharing of tools useful to more than one theme. Students work on projects involving diagnostic imaging, MR and PET imaging, cancer radiation therapy, radiology or nuclear medicine applications, bioinformatics, nano technologies and biophysics modeling. Industrial partners are manufacturers of imaging equipment, radiation therapy tools, radiation detectors, quality assurance phantoms, treatment planning systems, etc. Typically, this research is driven by pertinent clinical problems that require a fundamental and innovative approach with linkages to basic sciences or special expertise. This research is highly translational and the path from the research bench back to the clinic bed involves close collaboration with clinical as well as hardware or software company partners. Trainees within the MPRTN are exposed to a unique set of opportunities including fundamental research, internships in leading companies or access to vast clinical expertise particularly in cancer that provides invaluable feedback on how to steer a solution into a viable clinical tool or process. Theme 1, the Radiation Physics theme broadly represents research programs in radiation oncology physics, basic dosimetry, radiation detectors, Monte Carlo simulations in radiation therapy, physics of four-dimensional adaptive radiation therapy, physics of brachytherapy, novel computational techniques, instrumentation hardware and computational software, radiation physics applied to shielding and radioprotection, proton and hadron radiation therapy, etc. Theme 2, Imaging and Image Processing broadly deals with research such as, development of robust, automatic medical image processing techniques applied to neurology and neurosurgery, linear and non-linear registration and template building, image processing techniques using commodity hardware, metal artifact correction algorithms for CT and CBCT imaging devices, novel quantitative MRI methods and applying them to address fundamental questions in basic and clinical neuroscience, advanced PET reconstruction algorithms, multimodality image analysis with applications in PET-MR technology, etc. Theme 3, Radiation response, biophysics and nano science in medical physics groups the research that links advanced radiation therapy treatments to improved outcomes and may serve as a platform to develop biological models for therapy prediction and personalization. This new area, also known as Radiomics, uses computer simulations and experimental animal models along with advanced bioinformatics tools to link physical radiation treatment parameters. This theme also includes radiation therapy target volume definition from functional and molecular imaging as well as applications of nano particles in medicine.